Located just 15 kilometres from Digne les Bains in the Alps de Haute Provence, this hotel provides comfortable accommodation and quality service. The hotel Au Relais de Chabrières offers 7 rooms, all equipped with modern en suite facilities and free Wi-Fi internet access. All of the guestrooms are soundproofed and family-size rooms are also available. 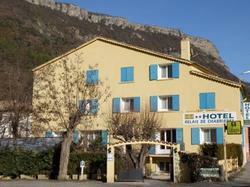 You will enjoy the lovely view of Chabrières Mountains from the non-smoking renovated rooms. You will also find at your disposal a terrace as well as a private car park as well as many restaurants nearby the hotel. At your disposal for free: car and motorbike parking, bicycle garage. Our Hôtel is 15 kilometres away from Digne les Bains, in the direction of Nice. Breakfast is served from 07:30 until 09:30. If you plan to arrive after 20:30, please inform the hotel in advance. Please specify the ages of your children on your booking form. In addition to the free car park, the hotel also provides motorbike and bicycle parking. Please contact the hotel in advance if you prefer having 2 single beds. With a view of the mountain, the room features cable TV, a telephone and the private bathroom includes a shower, a toilet and free toiletries. With a view of the mountain, the room features cable TV, a telephone and the bathroom facilities are shared.